Slots.lv Casino Review - Is Slots.lv Legal For US Players? Those looking for an online casino offering real-money games should pay a visit to Slots.lv. This is one of the newest Internet casinos to the industry and is quickly becoming a household name amongst loyal users. Slots.lv is backed by the same company that operates one of the largest and most reputable websites for legal online gambling in Slots.lv. On the surface, Slots.lv sounds like a website that has one specialty, but this is far from the truth. Slots.lv has a wide variety of slots and many other casino games. Account holders will have the chance to play all of the games on site for free or for real cash. Below, LegalCasinosUSA.com readers will find all the information they need on Slots.lv concerning depositing, withdrawing, earning cash bonuses and more! 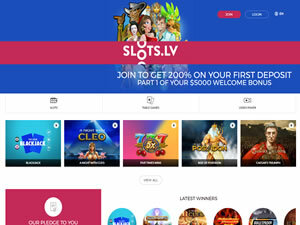 The signup process for Slots.lv takes just a few minutes to complete. Players in 46 of the 50 states in the U.S. are accepted. Unfortunately, residents of New Jersey, Delaware, Maryland and Nevada will be unable to sign up with Slots.lv. Residents in states that are accepted will just need to input some basic information to open their new account. This information is for the safety and security of all Slots.lv users. You will be asked to create a login and password to provide access to your account in the future. Users seeking to play for profit must deposit cash into their account. This can be done a couple different ways. Players have the ability to fund with a Visa credit card or a third party rapid transfer service such as Western Union or Moneygram. For the Visa card, any brand with the Visa logo is permitted as long as the card allows foreign transactions. This includes a credit card, debit card, and a prepaid card, the transaction will mirror online purchases that appear on your statement. A Western Union and MoneyGram transfer begins at any local retail outlet where those services are offered. Slots.lv requires a minimum of $100 to be deposited through this method with the cap set at $2,000. The customer service department must be notified of the confirmation number to input the funds once received, and then the funds will be available within 15 minutes. How does 10 bonuses from Slots.lv sound? That's what this online casino offers new users. The grand total adds up to $5,000 in total bonus cash. This can be achieved with 10 separate deposits of $500. Slots.lv will match each of those deposits 100 percent. This is a slots bonus only, with the bonus code HELLOSLOTS needed at the time of entry to receive it. Users accepting this will also comply with the 25X rollover requirement. This means that the full deposit amount + bonus will need to be played 25 times before it can be withdrawn. Outside of the slots bonus, Slots.lv offers a $1,000 table games bonus. The structure is similar to the slots bonus, only on a smaller scale. There are two eligible deposits for this bonus, capping off as a pair of $500 options. The bonus code HELLOGAMES will get you this cash. There is a 40X rollover for this option. Prospective users can access the complete set of Slots.lv games to check out, there are more than 160 great games that can be played for real money! The site breaks the games down into five categories, 3D slots, All Slots, Table Games, Video Poker, and Specialty Games. Players can click into each section and play the game desired. The wide selection ensures that all types of casino players will be well taken care of. Slots.lv Casino Software - What's Under The Hood? The software directing Slots.lv is Real Time Gaming, the top of the line for online gaming software. RTG casinos have a reputation of high quality and safety and the user-experience is second to none. We encourage readers to research RTG software for more information. There are a handful of easy payout methods to use at Slots.lv. The different options allow for players to choose a method that will work best. Courier Check - Taking between 5-10 business days to be received, a courier check is a safe, inexpensive option to withdraw. Each check carries a maximum of $3,000. For payouts higher than that, multiple checks will be sent out. Rapid Transfer - A minimum of $100 to a maximum of $800 can be received. This takes 1-2 days to receive but it is one of the fastest ways to get paid from this online casino. Unfortunately, players are unable to request a payout via credit card. Slots.lv can be reached through an online contact form. Here, users can include a message covering the topic they have a question or concern over. A 24/7 service line is also available over the phone at 1-855-446-3770.